Social isolation impacts all of us and is a growing health epidemic. 36% of seniors in Santa Cruz County report experiencing social isolation. These seniors feel alone, detached from family, friends, and the community. Isolation affects seniors and our whole community’s health. Loneliness leads to dramatic decreases in physical health, mental well-being, and overall quality of life. As our 60+ population is rapidly growing, social isolation has become an increasingly important issue Santa Cruz County seniors face. Half of the exhibition will feature artists from beyond our county, already making inspiring artwork on this issue. The other half will be created by C3 members. Together, artists, seniors, and senior advocates in C3 will create artwork that shares the personal stories, challenges, and triumphs of socially isolated seniors in our county. Through this exhibition, seniors will inspire us all and each other to find new ways to build stronger social connections in our community. This project is produced in partnership with the Santa Cruz County Human Services Department. In 2017, C3 members worked together on Lost Childhoods, a public art exhibition about transition-age foster youth across California. 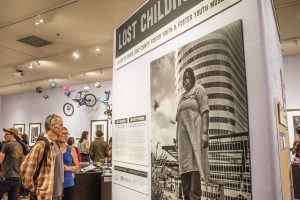 This exhibition was created with the Foster Youth Museum and MAH’s Creative Community Committee (C3)— a group of over 100 local foster youth, artists, and youth advocates. Revealing what happens in foster care and concrete ways to support child welfare today, this is more than a moving exhibition– it is a powerful platform for dialogue and action in Santa Cruz County. Click here to see more photographs of the exhibition. This project was made possible with support from the National Endowment for the Arts and California Arts Council, a state agency. There’s a lot more information about the project in this grant proposal narrative. Join us for a fun-filled day with a screening of the film, Hunt for the Wilderpeople. We’ll hang out at the MAH, watch a movie, enjoy ice-cream and get in touch with our adventurous spirit with youth-led art activities. Laugh, chat, and sit for a screening of docu-comedy series, The F Word. This series chronicles the journey of Nicole and Kristan, an Oakland-based queer couple who want to adopt a kid. This short, comedic documentary series chronicles their journey into the foster care system to become fostadopt parents, bumbling through a bizarre and bureaucratic maze in order to learn everything they can about the troubled institution on which they are staking their dreams of parenthood. After the film screening will be a Q&A discussion with Nicole Opper, followed by discussion break-out sessions facilitated by community partners and collaborators who made the exhibition possible. Bring an object, memorabilia, or photograph to share with the public. The theme of this pop up is COMFORT. What brings you comfort? We will ask you to write a brief label about the object and how it comforts you. Our collaborator, New Families, Inc. is a Foster Family Agency, founded in May, 1999 by Janet Parske. Ms. Parske has been a strong advocate for children for over 20 years. New Families in conjunction with our certified foster families, provides care for abused, neglected and troubled children. * A Pop Up Museum is a temporary exhibit created by the people who show up to participate. It works by choosing a theme and location, and inviting people to bring something on topic to share. This Pop Up Museum invites you to share your story with others to connect and share your story. How have Santa Cruz County communities journeyed through struggle and into resilience? These Lightning Talks on The Struggle is Real will focus on life’s many challenges and transformations spanning across class, race, gender, and sexuality, to transportation, healthcare, foster care; from incarceration, and education, to housing, mental health, and homelessness in Santa Cruz County. Talks begin at 8pm, precluded by Intercultural Facilitator and Community Action Board board member, Silvia Austerlic’s workshop, Fostering Resiliency: Building an Inner Sanctuary from 7-8pm. The Lost Childhoods Alternative Expressions Programming kicks off with it’s first Watercolor Journaling workshop! Learn from collaborator, Gay Kraeger who will provide non-threatening, easy-going techniques that cover the basics of drawing, writing, watercoloring and journaling.A variation on the written journal is an illustrated journal — adding the richness of hand drawn images to words. *This Pop Up Museum is in collaboration with the Cabrillo Guardian Scholars Program. Meet us in the Aptos Campus Quad and bring an object! This is the first of two Pop Up Museum collaborations with Guardian Scholars and the MAH. *This Pop Up Museum is in collaboration with the Cabrillo Guardian Scholars Program. Meet us at the Watsonville Campus (in the Watsonville Center Building A) and bring an object! This is the second of two Pop Up Museum collaborations with Guardian Scholars and the MAH. Join a creative discussion with Encompass Community Services and the local Youth Advisory Board on ending youth homelessness in Santa Cruz County. Hear updates on the Youth Homelessness Demonstration Program‘s initiative designed to reduce the number of youth experiencing homelessness. Bear witness to powerful youth presentations and spoken word performances. Learn techniques and skills in building self-advocacy! Participants of this workshop will develop a greater understanding of one’s own needs and gain confidence in recognizing one’s own abilities. The Human Services Commission is holding a public meeting at the MAH. Commission meetings help facilitate citizen involvement in government and to assist the Board in its decision making process. The meeting will begin at 8:30am and end at 10:30am. Meeting members will enjoy a walkthrough of the Lost Childhoods exhibit at 9:45am. Plants and the natural world carry gifts of healing, medicine, friendship, and so much more. Join this workshop to get hands-on with gardening and herbs at the UCSC Farm. Participants will gain knowledge on the medicinal properties of a few select herbs, and will get to make their own chapstick! Come get your sew on! We’re making punk patches and learning alternative sewing methods with a variety of fabrics, stitches, buttons and pins. Make patches for your backpack, jacket, or your local revolution. This is part 4 of 4 of the Lost Childhoods Alternative Expressions Intern workshops. Join California Youth Connection and the MAH to discuss how foster youth not only survive, but thrive, contribute and make a difference. This event includes panel discussions from current, former, and older generations of foster youth, and youth-led performances. The Santa Cruz County Superintendents are back again to the MAH to hear directly from local foster youth. This public meeting features a walkthrough of Lost Childhoods, and a panel of local foster youth who will describe their journey through the educational system in Santa Cruz. Project K is an event that raises awareness of conformity and stigma in today’s society, and how it can lead to homelessness. Hear from youth guest speakers with lived experience, and enjoy great food, fun activities, and an eye grabbing presentation! The MAH proudly hosts the Y.O.U.T.H. Training Project in conjunction with the Lost Childhoods exhibit. This training provides training hours for services workers and is appropriately intended for social workers, child welfare professionals, former foster youth trainers. In this highly interactive 3-hour training, child welfare professionals and former foster youth trainers will interact with stories and narratives found within Foster Youth Museum.